In 1972, the first Meadowlands District Open Space Plan called for seven public areas comprising 24 acres. Since then, more than 100 acres of open space, 21 parks and eight miles of trails have been preserved, designed and constructed in an environmentally friendly manner, incorporating low-impact construction techniques, native plantings, and recycled materials. Below are highlights of the Meadowlands District park system. • No feeding wildlife or picking flowers or vegetation. • In case of an emergency please contact the Lyndhurst Police Department at 201.939.2900. DeKorte Park features 3.5 miles of walking paths, panoramic views of wetlands and waterways, and birds galore, all framed by the New York City skyline. The park, which was once slated to be a landfill, is the focal point of NJSEA activities. Birders and nature lovers frequent its trails and educators from the park’s Science Center lead hands-on environmental education classes for school groups. DeKorte’s William D. McDowell Observatory is open to the public for free stargazing on Wednesday nights year-round. The park is also home to the NJSEA’s administrative offices. A series of colorful, interpretive signs highlight the park’s resources and the wildlife that inhabit its tidal waters, marshes, and uplands. These informational signs provide visitors with an understanding and appreciation of the Meadowlands’ unique and diverse urban eco-system. SOME OF DEKORTE PARK’S MOST POPULAR AREAS ARE HIGHLIGHTED BELOW. The Marsh Discovery Trail is one of DeKorte Park’s most popular trails. The half-mile boardwalk loop extends over the park’s tidal impoundment, known as the Shorebird Pool, and includes bird-blinds, study docks, shaded and open classrooms, and several seating areas. Constructed in 1991, the trail attracts thousands of nature lovers, bird watchers, school children, and those simply looking for a tranquil place for relaxation. The walkway provides an up-close vantage point for visitors to observe and photograph the Meadowlands’ abundant wildlife and stunning natural beauty, and for schoolchildren to gain valuable first-hand knowledge about the region’s unique urban eco-system. It is an especially great spot for bird watching given its habitat for nesting and migratory birds. Once part of the now-closed Kingsland Landfill, the six-acre site was initially called the “Experimental Park on a Landfill.” It was the first landfill-to-parks project in New Jersey and one of the first in the country. The Kingsland Overlook also included the first use of a synthetic liner to cap a sanitary landfill – the liner was manufactured from 400,000 recycled soda bottles. The Overlook’s quarter-mile trail provides wildlife habitat, environmental education opportunities, and a spot for visitors to enjoy a great scenic view of the Meadowlands and the Manhattan skyline. Decades after construction, native plant communities have thrived and matured, including wildflowers and herbacious perennials. There has also been a marked increase in the diversity of animal species and number of nesting birds on the site. This 3.5 acre site was once an illegally filled garbage island dating back to the 1950s. In 1989, the agency began restoration work on the site. A breakwater wall was built around the area’s perimeter to allow the establishment of native marsh grasses. Later, soil was brought in and sculpted to form hills and valleys. The interior plantings emphasize natural succession, plant and animal habitats, and environmental education. A trail leads visitors past interpretive signs, wildlife observation areas, and native plant communities. The mile-long Saw Mill Creek Trail brings visitors out near the vast mudflat of the Saw Mill Creek Wildlife Management area, providing a rare sense of wide-open space. The base of the trail was initially built in the 1920s and 1930s as an access road for what are now high-tension electric lines. It was reconstructed as a walking trail in 2001. This 1.2-mile trail runs from the western spur of the NJ Turnpike to the trailhead for the Saw Mill Creek Trail. With views of the tidal mudflats on both sides for much of its length, the Transco Trail is an excellent place to look for shorebirds and other wildlife. The World Trade Center Memorial Cove is located on the edge of the marsh adjacent to the NJSEA administration building, looking out toward the lower Manhattan Skyline. It consists of a sinuous freeform wooden deck with two projecting piers, suggesting shadows of the fallen towers. The piers are proportioned after the World Trade Center towers. Each is covered with 110 boards, which represent the 110 floors of the towers. A silhouette cut from Corten Steel shows the pre-9/11 skyline and is visible from the deck. Visitors can stand in a designated spot to see exactly where the towers once stood in the skyline. Billowing native grasses planted on the side of each dock create a sense of separation and solitude. The memorial was funded in part through a partnership with Ducks Unlimited. It was rebuilt in the summer of 2013 after suffering extensive damage during Superstorm Sandy. A porcelain enamel plaque dedicates the site in memory of those who lost their lives on Sept. 11, 2001. The quote on the plaque is from the 19th century American orator Robert Ingersoll. It reads: In the night of death, hope sees a star, and listening love can hear the rustle of a wing. Located outside the Meadowlands Environment Center, this butterly garden was built to honor the memory of Jill Ann Ziemkiewicz, the youngest member of the flight crew assigned to TWA flight 800, which fell into the ocean off Long Island on July 17, 1996. 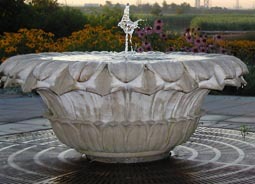 Known as Jill’s Garden, the space includes a hand-carved limestone fountain shaped like a sunflower, Jill’s favorite. The Garden was designed to be an open, cheerful and welcoming area that reflects Jill’s vibrant personality. The Jill’s garden is the centerpoint of the NJSEA’s Annual Butterfly Day event each July, which has grown to draw upwards of 1,000 people to DeKorte Park. The Butterfly Brochure can be downloaded from the link at the top of this page and printed copies can be found at the entrance of the park. The Carillon was constructed in 2007 by the AMVETS Post 20 in Lyndhurst, with funding help from the agency. The 40-foot structure features three bells that toll several times an hour. Benches surround the tower at a site overlooking the open water. The Mill Creek Marsh meets the Hackensack River at Mill Creek Point, a three-acre public park constructed by the agency on the site of an old restaurant and marina. The park includes great river views, benches, and a launching ramp for canoes,kayaks, and other small watercraft. Designed in 2004, the park also has areas for wildlife viewing and catch-and-release fishing. A railing featuring silhouettes of local birds edges the promenade. Interpretive signs describe wildlife and help guide visitors to canoe trails. For the previous 50 years, the property housed a private marina and boat launch as well as Tony’s Old Mill Inn, a popular restaurant and pub. The original Tony’s Old Mill is said to have been constructed on the remains of a gristmill built around 1840. As early as the 1760s, numerous sawmills and gristmills operated along the tributaries of the Hackensack River. South of the park is the Secaucus Wetlands Enhancement Site, where an elevated boardwalk provides students from nearby Secaucus High School and the public a close-up view of a restored urban wetland. At the other end of the marsh is the Mill Creek Marsh Trail, where at low tide visitors can see stumps of Atlantic White Cedars that once forested the region. You can reach the south end of Mill Creek Marsh by taking Route 3 to the Mill Creek Mall and parking next to the Bob’s Discount Furniture. Once the proposed site of a townhouse development, Mill Creek Marsh was preserved and restored by the agency in 1998. The invasive Phragmites reeds that had choked the marsh were replaced with native plant species to attract a diversity of aquatic life and birds and tidal flows were reestablished in the wetlands. The one-mile Mill Creek Marsh Trail provides breathtaking views of the wetlands and the New York City skyline which frame the 209-acre natural area. The most notable characteristic of the marsh is the dozens of ancient white cedar stumps that dot the waterway. They are the last remnants of a primeval forest that once covered a third of the area for hundreds of years. Today the rot resistant stumps serve as perches for egrets and shorebirds, making the marsh an especially popular destination for bird watchers. The tide will affect what you see in the Mill Creek Marsh. At high tide the shoreline is covered by six feet of water. At low tide the water line falls below the mudflats, revealing the edges of the channel. The tidal flow affects the visibility of the channels. When the tide goes out, the channels are more visible. If the tide is coming in, the channels will be difficult to see. At mid to high tide, additional areas are available for exploration. In 1996, the New Jersey Meadowlands Commission purchased the marsh and used the mitigation funds for restoration at the site. Wetland enhancement at Mill Creek included grading of the marsh surface by creating additional meanders and tidal channels. Excavation of shallow pools began to provide more open water habitats. The result is a low marsh habitat flushed daily by tides. This created lowland scrub-shrub passerine habitats, dabbling duck habitats, shorebirds, wading birds, wintering and migratory habitats. Additionally there is greater fishery access and some degree of mosquito control. A passive park and walking trail along the upland portions of the site was created. In 1999, the New Jersey Meadowlands Commission acquired 77 acres of the site known as the Eastern Brackish Marsh. Mill Creek is a tributary of the Hackensack River. This 28-acre natural area comprises six acres of meadow and a 22-acre lowland forest – one of the few remaining woodlands in the District. The park is named for the Hackensack River tributary running through the park. Losen is Dutch for “loose” (as in winding), and Slote is Dutch for creek. In colonial days, the area was a semi-wilderness of marshes and wet woodlands. In the early 20th Century, however, the construction of dikes and tide gates drained much of the marsh areas. The park’s diverse environment supports many migratory songbirds, as well as a variety of small mammals and reptiles. On a summer’s day, you might see an Eastern Box Turtle, an Indigo Bunting, or a flock of Cedar Waxwings. Nearby Mehrhof Pond, once a clay pit for a local brick factory, is now a major site for wintering waterfowl, especially Ruddy Ducks, which congregate by the hundreds until the pond freezes solid. The park was designed and constructed by the agency and is owned and operated by the Borough of Little Ferry. The 70-acre Hudson County park features ball fields, playgrounds, a public boat ramp, and panoramic views of the Hackensack River and the vast Saw Mill Creek Wildlife Management Area. An expanse of 200-foot-high cliffs provides a stunning backdrop. The rock formation known as Laurel Hill that frames the park is a pipe-like diabase intrusive, which is believed to be an offshoot of the nearby Palisades Sill. It was largely obliterated in the 1960s by quarrying that reduced the height of some sections by one-quarter and the area of its base by four fifths. Part of the hill was destroyed to make way for the New Jersey Turnpike in the 1950s, and much of the remainder was removed during quarrying operations in the 1960s and 1970s. It is said that in the 1890s Laurel Hill inspired an advertising executive passing by the structure on a commuter train to create the Prudential Insurance “Piece of the Rock” slogan and Rock of Gibraltar logo. For safety reasons, the cliffs are currently off-limits to the public. For nearly a decade, the cliff has been home to nesting Common Ravens. Other birds of note that can be seen at Laurel Hill Park include peregrine falcons and great cormorants, which perch on the nearby Hackensack River Swing Bridge in the winter. A pair of Osprey have successfully nested just across the Hackensack River from the park, near the eastern spur of the New Jersey Turnpike. Laurel Hill Park has a fascinating and storied history. Originally the area was called Snake Hill due to the large black snakes that inhabited the park. As far back as the late 1700s, the 200-acre site was the home to government buildings, beginning with an alms house. In the 1840s, Hudson County started locating other institutions there as well, including a penitentiary, psychiatric hospital, orphanage, tuberculosis hospital, a farm, three cemeteries, and a workhouse with a quarry where inmates crushed stones. Three churches were located on the hill as well. By the 1930s, the institutions had begun falling into decline, and over the next few decades the buildings were shuttered and demolished. After the prison closed in the late 1950s, the Penitentiary Quarry was turned over to private quarrying operations with an eye toward leveling the hill and turning it into a county park. River Barge Park and Marina is located at 260 Outwater Lane, Carlstadt, NJ. River Barge Park and Marina is a 5.5-acre, urban jewel located on the Hackensack River in Carlstadt. It provides much-needed public access to the river’s western banks in southern Bergen County. The park offers a variety of boating activities, splendid riverfront views and a tranquil setting for relaxation, bird-watching and environmental education. It includes a boat ramp, docks, paddling and rowing launch points, a 17-slip marina, a scenic promenade with picnic tables, and paths lined by native plants. The docks serve as the launch point for the NJSEA’s highly popular pontoon boat cruises. The two-hour tours run from June through September and are led by NJSEA guides who explain the region’s history and point out the area’s flora and fauna along the way. Download our Hackensack River Boating and Paddle Guide above to view maps of what you’ll see. Read more about Pontoon Boat tours. Guided canoe tours are also offered. The trips launch from various locations throughout the Meadowlands and focus on the region’s saltwater marshes. Read more about Canoe tours. River Barge Park, which opened in 2008, has a rich history. In the 1940s, the site was part of Sky Harbor, a seaplane base that trained hundreds of aviators during World War II. The property later became the home of the Barge Club, a very popular local restaurant in the 1970s and 1980s named for two covered wooden barges that made up the core of the facility. 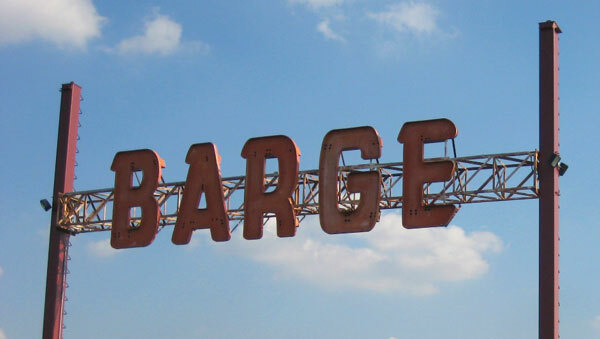 The restaurant owner’s collection of nautical and regional artifacts, including ballasts and channel markers, are displayed throughout River Barge Park. Beautifully illustrated interpretive signs further evoke a sense of place and identity. The Hackensack River estuary is the major natural resource of the Meadowlands District and a perfect living laboratory for education. It teaches us about our environment and our history. Getting people out on the river is an important objective of the Authority. To learn more about River Barge Park download the Brochure. Directions to Laurel Hill Park. The Hackensack River Public Boat Launch at Laurel Hill Park provides a boat ramp, seating areas, information kiosk, parking for tow vehicles, and access to the Hudson County Park’s waterfront promenade. Additional information about Laurel Hill Park in Secaucus can be found above under parks and trails. Download our Boating and Paddle Guide. North of Laurel Hill, also in Secaucus, is Mill Creek Point Park. This is a three-acre public park built by the agency and maintained by the Town of Secaucus. Canoes, kayaks and other small craft can launch and explore Mill Creek Marsh, a 209-acre wetland where visitors may see Green-winged Teals, Tree Swallows, and other wildlife with the New York City skyline as their backdrop. More information about Mill Creek Point Park and Mill Creek can be found above. Download our Boating and Paddle Guide. Find out more about all of our Meadowlands tours.